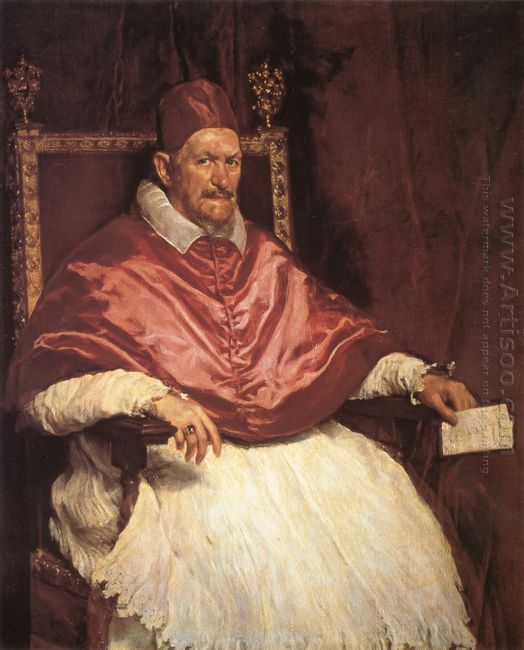 Portrait of Pope Innocent X was perhaps Diego Velazquez outstanding portrait. The figure in the painting was the pope who ascended the throne in 1644. This pope seemed to never leave a good impression to people based on the people’s notes. Even he was considered to be the ugliest man throughout the whole Rome. Reportedly, his face was not symmetric and the forehead was bare, who looked somewhat deformed. And his temper was irritable. However, such an ugly and gloomy man became a perfect descriptive theme under the Velazquez’s brush. The whole painting took the red as the background and showed a sense of dignity to bring out the pope’s serious majesty. The pope’s face showed an instant strong expression and portrayed the cruel and cunning inner world; but from the Pope’s weak and feeble hands in the chair, it was not difficult to find out his spiritual weakness, which enriched the Pope’s image and left the unlimited reverie for the future generations. His red cape on the pope and white vestments formed a strong color contrast and rendered the painting’s solemn and dignified atmosphere. This painting showed the painter’s superb painting skills, which had the high artistic value. To The Parnassus was Paul Klee masterpiece, which deeply expressed the painter’s great desire to reach the artistic peak. The subject of this painting contained two tiers of meanings. The first layer of meaning is: based on the myths and legends, Parnassus was the holy mountain in charge of art and music God Apollo and Muse. This work clearly expressed the painter’s wish to enter the temple of art. the the color of light. What these colors expressed was Klee’s inner feeling and his thought and insight for the life. The whole Expressionism painting not only had the rich contrast between the top and the bottom, but also owned the gradual upgrade from the lower left to the upper right. With this contrast and gradual change, Paul Klee created the indeterminate light and whirling visual effect and appropriately showed his slightly confused mood when he was in the pursuit of career. This painting also showed Paul Klee’s view of life: climbing the peak needed the constant accumulation, and consistently enriched its spiritual world. Western painting includes oiling painting, block, copperplate, watercolor, and poster color, etc, among which oiling painting is the most expressive, practical and decorative painting. For the subject, oiling painting can be mainly divided into theme painting, genre painting, landscape painting, portrait and still life. But whatever the subject is, works mainly rely on shape and color these two main elements. In other words, the ways of expression of paintings are shape, light and color. Shape, or we can say, form and structure. This requires that the artist must have the ability to shape first, and he must have a strong foundation sketch. If the artist is not good at charcoal drawing, it would be difficult for him to draw a good oil painting. Light is the effect of light. After the rise of French Impressionism, people triggered the research and manifestation for light, and painter tended to have a scientific and rational understanding of it. the pass line. In addition to the above requirements, the appreciation of oil paintings should also focus on composition, strokes, rhythm, etc. 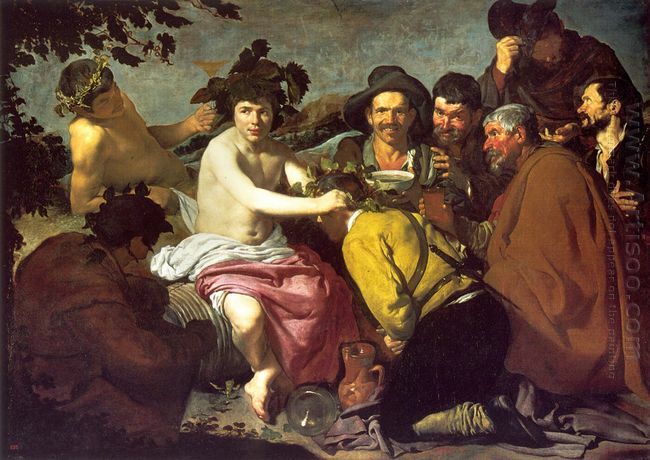 Triumph Of Bacchus was based on the Roman mythology. Bacchus was Dionysus in Greek mythology. According to the legend, he pioneered the use of grape wine, and spread the methods of the grape growing and honey gathering to the whole world. But Velazquez used the Spanish peasant image and its way of life to represent this scene. These figures wore the hat and the thick coat and were drinking in high spirit. They were saluting to the young bacchus. The bacchus was half naked and wearing a hat with wings and giving a person back to the audience with flowers. His eyes were squinting out of this Baroque painting. There was only the optimistic life and farmer’s enthusiastic character. There was no the bacchus in the legend. All of this was just a life scene that the Spanish farmers drank during rest. Appreciation of this painting made people reminiscent of the humorous philosophical spirit described in Cervantes in his “Autobiography of Don Quixote”. How to Protect the Oil Paintings? 1. get some natural beeswax which dissolved in turpentine, then coat twice in the back of canvas thinly, it would absolutely prevent the wet air. 2. Avoid long direct sunlight, ultraviolet has huge destructive effect to the color, it would cost color fading and changing color. 3. The room which store oil painting should be ventilated and dry, be away from bathroom and kitchen as much as possible. Avoid the dust, lampblack and mildew to cause damage. Keep a certain temperature and humidity in room. Once the painting become damp, it must dry in the shade, must guard against the blazing for a long time, otherwise the painting would easily fall off. 4. 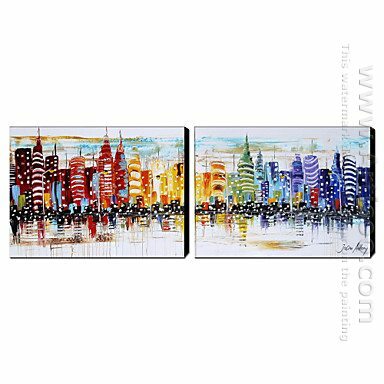 Never stick one painting to another painting, the painting may paste in each other when the temperature is high then cost falling off and damage. 5. While rolling the oil painting, use more than 4 or 5 inched paper tube, canvas inside and painting outside, then wrap it with a plastic cloth to avoid crack..
6. If there is dust in the painting on the wall, use sight-damp clean cloth to wipe it. If there is lampblack, use diluted soap-suds and fresh water to scrub it then immediately bring some thing to absorb the water, then use a fan to blow the water. For the longstanding and cracked oil painting, use less water, part wiping is enough. Some people buy gross oil to maintain the oil painting, it’s available, but the painting must get clean before the spraying. 7. Generally, oil canvas could preserve for two to three years. As the time goes by, some painting may start to crack. So, pack up the paintings which not on the wall with cloth if you have many collections. Put then to a wood box. There are for reference only, more skills still need the collector to ponder in practice, constantly sum up and enjoy from the process. 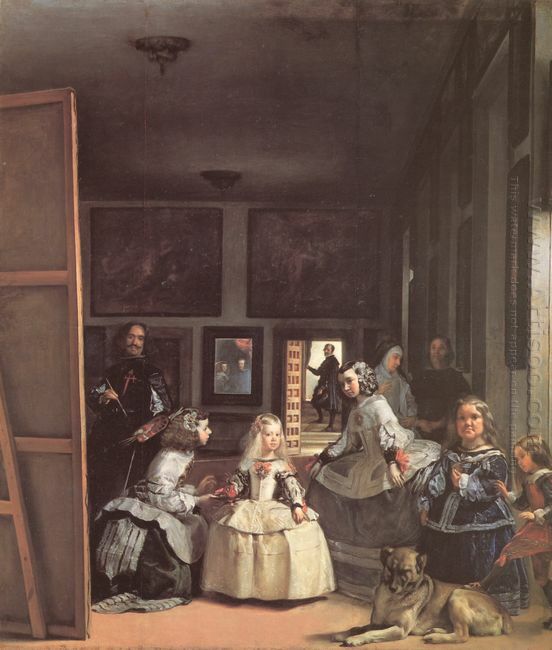 Las Meninas Detail of the Lower Half Depicting the Family of Phi was made by Diego Velazquez in 1656.
every corner of the room. The painting was undoubtedly a very good work seen from the art sense. 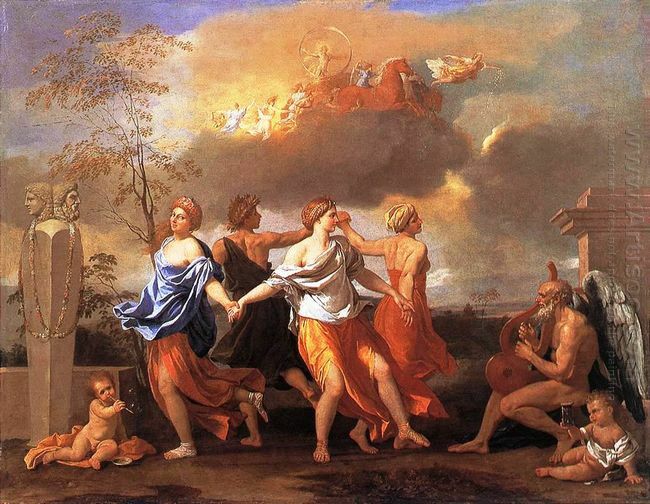 Dance to the Music of Time was made when Nicholas Poussin was commissioned by Pope IX Clement. He was the philosopher and playwright, who was also the typical admirer and collector of Poussin’s works. This Nicolas Poussin painting was made in 1638, measuring 82.5X104cm, which is collected in the London Wallace Museum. This genre painting brought a sense of information or confusion, which was a general discussion about the time, fate and human survival. What it appealed to the viewers was the ration rather than emotion. The composition of symbolic implication of Poussin in performance and geometry coordination made the conception in the specific form. The round dance represented the reciprocating life cycle and each dancer had its implicated effect. The dancers in the painting were the four allegorical figures: wealth, happiness, diligence and poverty. In this classicism painting, various elements that showed the changing time were around the dancers. Everyone’s expression in the painting looked concentrated and enjoyed dancing, which was admired by people with its shown beauty and harmony. The work invited us to discuss the meaning that the four figures represented as well as the significance between them and other symbols of the background. In the distant dawn, the sun god Apollo was going ahead with the carriage under the guidance of goddess of dawn. The middle of the painting was a four-member waltz. They represented the wheel of fortune which was composed of four stages. People would spend the rest of their life through this cycle, again and again. 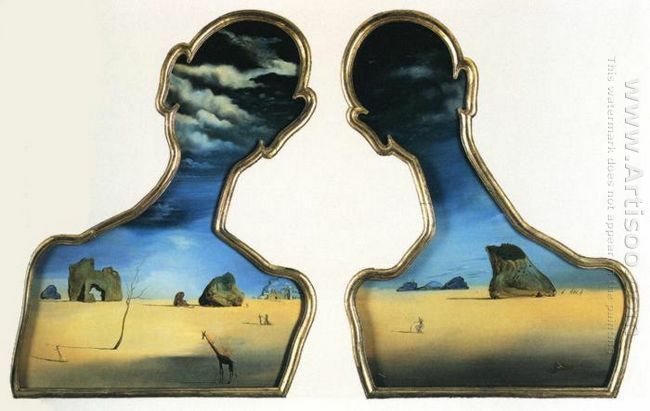 The painting was full of eternal and short contradictory images. The old “Father Time” played the harp for the dancers. Besides him, the naked children held an hourglass; the time flied with the stream of time. This was a masterpiece with the precise composition and accurate skills. All of Poussin’s works implied a complex but perfectly reasonable and carefully designed geometry. One of the funs was to appreciate the potential geometric structure in his work. In this painting, the dancers’ circular motion was placed in a triangle. importance to detail in the background of his paintings as he did his foreground, he used muted colors so as not to distract from the main scene and yet they also reflect the feel and mood of the piece. 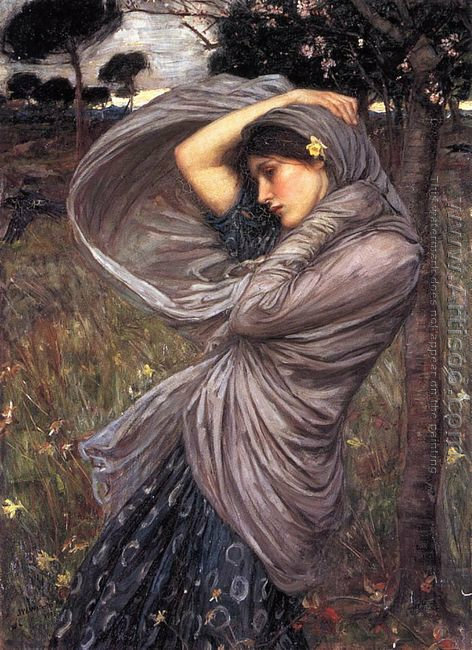 The exquisite lines and elegant structures of the waving clothes Waterhouse painted shows the romanticism he wanted to express. bluebells and grass. We can see two women are involved in the beautiful scenery. One woman leans on a tree peacefully in a little far distance, losing in deep thought. Her facial expression can’t be seen very clearly. Maybe she is immersing in deep thought or just addicting to this fascinating sea of flowers. The other woman sitting in a fabric seems to indulge herself in this wonderful scene. Her pose makes her so natural and comfortable. 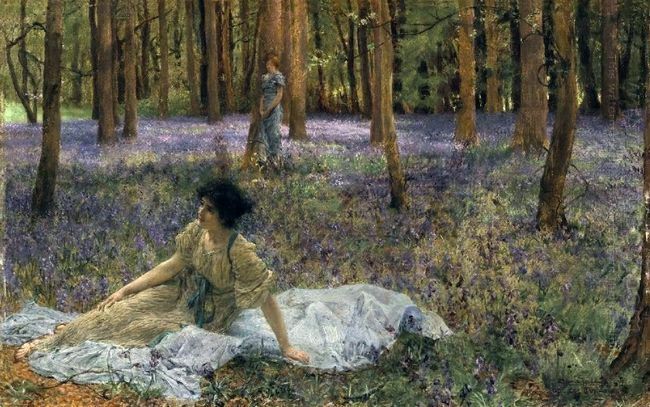 Alma-Tadema was a perfectionist who attached high importance to every detail and architectural line while painting. He valued the most precise accuracy in the details of his compositions. The brilliant colour, delicate setting, the people and the objects he painted reveal a vivid and lively scene, expressing a strong romantic feeling and gentle sentiment which make viewers involved in this attractive scene.